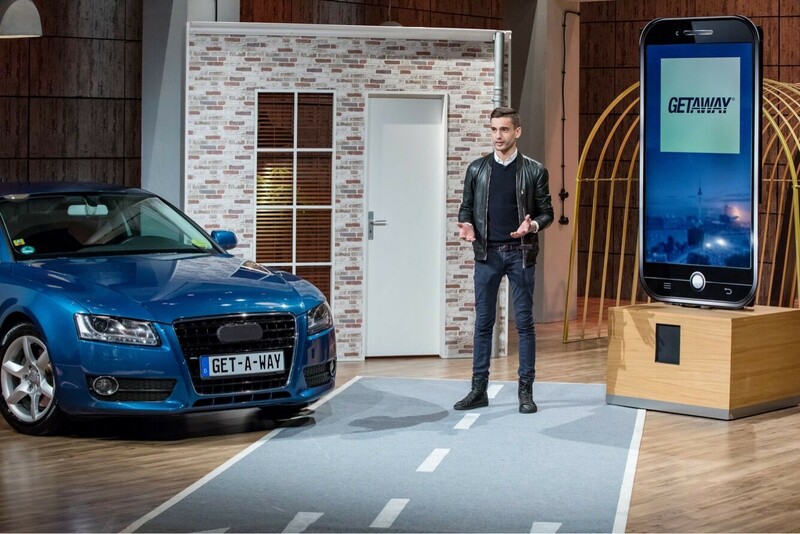 In the course of the German start-up show Die Höhle der Löwen (DHDL) GETAWAY, a P2P car sharing startup, pitched but got rejected. GETAWAY wants to enable spontaneous car renting. The investors rejected the start-up because they do not own the appropriate expertise, considered the valuation too high or because they thought that the capital required to get the company started was too high. Most of the money GETAWAY wanted to rise would flow into equipping each registered car with a hardware module that coordinates the sharing (tracking time and fuel, and allowing access to the car through the app). GETAWAY installs this hardware module and if you an early adopter in a certain area you will get it for free. Getting one car ready costs the company between 400€ and 450€. This is a lot of money especially if the startup does not charge for it. Hopefully (for GETAWAY, not users) it is a proprietor system so that no other competitor could build upon their infrastructure. The car’s owner determines the price you pay for a drive and insurance is included in it. The company wants to finance all that by a 33% commission. As GETAWAY is a network the right amount of sharers (i. e. the people offering the cars) must meet the right amount of renters for it to be successful. The overlap between these groups is small. As the company positions itself as a competitor to car sharing, renters will demand the same things from them as they do from car sharing companies. These requirements lead to several issues. People expect a specific car (e. g. SUV), with a certain safety and feature standard (air condition, Bluetooth, seating for kids…) whose interior and exterior is in good condition. Because GETAWAY is not maintaining the cars, they cannot ensure perfect quality along these parameters. Furthermore, people need cars at the right time. This is where it gets critical. A car owner will only share her car when she does not need it for a longer period of time, say above an hour. For anything beyond 60 minutes the hassle of setting it up and the risk of not getting the car back in time is too high. Such periods are most frequent during the night and work hours. However, based on the same logic, this is also the time where cars are needed the least. Thus, GETAWAY must pair people with complementary timetables. It is almost impossible to find 40 million such matches. Furthermore, we must not forget that they target spontaneous renting. This means that the right time is always now. Closely related to the topics of matching schedules is that owners must be willing to rent cars for a duration that suits renters. These two issues narrow the possible matches down even further. Sharers expect to find their cars where they left them. This means that where the owner needs the car at the end of the renting period must overlap with where it is convenient for the renter to drop it off. This is very unlikely to happen. Imagine that you as a renter must go from A to B and then again back to A because that is where the sharer needs its car. The following points apply exclusively to sharers. Lots of people simply dislike having something built into their car (in this case GETAWAY’s hardware module). They company is, however, working with manufacturers to have it built directly into cars . Furthermore, offering your car involves work from you site; you have to configure your car’s availability each time. Whereas that are only a few steps, people are busy and very comfortable; they won’t have the time or motivation to configure it each time they use their cars. People love cars. Although it is changing, I doubt that there are (yet) many people willing to leave their personal belongings in a car driven by a stranger. If they were to empty the car, they would be driving a car which they do not own „emotionally“ and thus conflicts with their love for cars. Besides low incentives (see below) this is the most difficult problem to manage. When you lent your car to a stranger you do not know how it will come back (e. g. position of seats and mirrors), when it will come back, if it will come back at all or whether the renter committed a crime (e. g. drove over the speed limit). And whereas you are insured through GETAWAY, and the renter is reliable for any violations of the law, it is still you who has to do the work; cleaning the car, bringing it to the mechanic or readjusting the seats each time you get into your car. Also, your car will need more maintenance if its utilization increases and thus require more time and money investment from you. Imagine further what would happen if you are reliant on your car and it never comes back or comes back in a state that you cannot drive. All the points I have mentioned for sharers above are especially true if the incentives behind it (i. e. the money you earn by lending) is relatively low. Admittedly, the addition „relatively“ is extremely vague, and I cannot put any number to how low low really is, but based on gut feeling I think it must not be below €200 (or probably €300) monthly and must furthermore be repetitive income. If P2P sharing is really that advantageous compared to owning a car or B2C car sharing, the question is why would anybody then anybody own a car? Furthermore, the costs for these five million people owning a car, will rise exponentially due to their cars’ increased utilization. This, in turn, will require more time and financial investment from them and eventually turning them into one man businesses. All these constraints inevitably point at the fact that P2P car sharing cannot become a mainstream phenomenon. In this context, it was often associated with AirBnB. There are few reasons why this is wrong, but the biggest are predictability and availability. Firstly, you do not need an AirBnB now (predictability) and secondly a sharer’s and renter’s living needs are complementary (availability). You can live in an apartment all year and still rent parts of it. You cannot, however, rent one seat of your car. Furthermore, you can rent your apartment while away and especially during holiday season your and your renter’s timetables will not interfere. Considering that P2P car sharing cannot become an „eliminating 40 million cars business“, the question is whether P2P car sharing makes sense at all. For that one must view it in the overall context of mobility. The current tenor is that in the future our cars will be self-driving, automatically rentable (the same as GETAWAY but completely autonomous) and that we will have self-driving taxis. In such a scenario P2P car sharing makes a lot more sense because the car takes care of all your work. The problem of complementary car needs still exists but is easier manageable with cars that can think and act on their own. This is, however, a very distant (10+ years) future. These niches are twofold, and here it merits to compare it with AirBnB. Similar to AirBnB there will be times where you do not need your car (holidays, weekends, days off…) and there will be people who need or want a car at that specific time. And although P2P sharing is cheaper than B2C, the price difference will not compensate for the lack of uncertainty (as discussed above), except you need or want a specific car. And this is where the second niche aspect, car type, comes it. You will have situations where you must travel longer distances, go across borders, transport something or simply want to have fun in a sports car. Turo and croove do a great job here. Turo, a P2P sharing company from San Francisco, has nine car types of which only two are “normal” categories (fuel-efficient and everyday cars), the rest are specialties like SUVs or convertibles. On croove, a German startup, users offer cars like an Audi R8 or a Mercedes-Benz C 63 S AMG. Here the value proposition compared to B2C car sharing is clear; suppliers are willing to undergo uncertainties because they can charge a premium. This premium, in turn, is possible through the special cars they offer. Similarly, renters are willing to undergo risks because they get cars they would not have gotten otherwise. As a consequence, both groups can match because renters do not need cars immediately and both sides can plan upfront. Furthermore, sharers and renters have complementary time schedules because owners are lending their recreational cars which they do not use daily. PS: One thing that bothers me on a personal level (?) is that GETAWAY does not have a consistent naming; they switch — it seems randomly — between GETAWAY and GET-A-WAY. One of the first cars coming with the GETAWAY module built-in is the Sion an electric car by the German startup Sion Motors on which I have done an analysis here.